One of the finest examples of native grassland in the area can be found at the entry to Bowman Hills Wildflower Preserve, along the Pennsylvania side of the Delaware River. I stopped by last Friday, while driving from Washington Crossing to New Hope, and found it in full bloom. 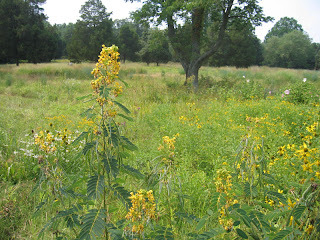 The photo shows Wild Senna, which likes the wetter soils at the bottom of the slope. All the classic prairie grasses can be found here: Big Bluestem, Little Bluestem, Indian Grass and Switchgrass. 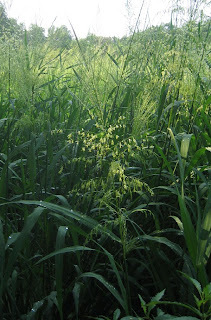 The Big Bluestem--the dominant grass of the tallgrass prairies of the midwest--are eight feet high. In Princeton, the most likely place for future native grasslands to be planted is in the retention basins at local parks. One such project is underway at Farm View Fields, with help from Partners for Fish and Wildlife. 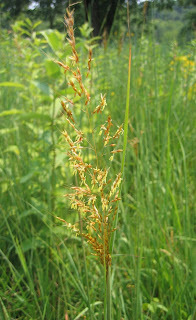 Indian Grass is the most common warm-season prairie grass to be found in the area. It needs sun, so likes areas that are mowed yearly, such as roadsides and right of ways. The anthers give it a golden tint this time of year. Back in pre-colonial times, it would have been munched on by buffalo, whose range once extended to the east coast. One of the more spectacular sights this time of year in Princeton is the wild rice blooming at the Rogers Wildlife Refuge. Though sometimes called "the Institute Pond", the refuge is actually located on water company property. A giant step towards restoration of the marsh was taken last year when Partners for Fish and Wildlife treated the invasive giant Phragmitis reeds that were slowly but surely taking over the marsh. Quickly taking the place of the Phragmitis monoculture is an impressive array of natives, including the wild rice, pickerel weed, arrow arum and water plantain. The refuge lies between the Institute Woods and Stony Brook, at the end of West Drive. It's best known as a birding mecca, and is taken care of through a collaboration between Friends of Rogers Refuge (FORR), the township and the water company. To get there, take Alexander Road down almost to the canal, turn right on West Drive and stay left until you reach the small parking area next to the observation tower. Wild rice, like corn, is an annual that grows to astonishing heights in a single season. 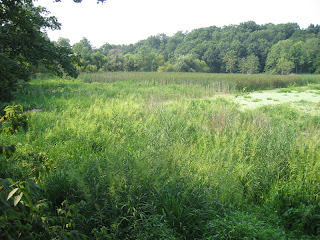 Most people associate it with Minnesota, but it flourishes in Princeton, the Trenton Marsh, along the Connecticut River, and I've even seen it growing in a stream in Florida. Many of the showiest wildflowers along the canal in Princeton bloom this time of year. I'll be leading a walk along the towpath this Saturday, August 11, at 10am, starting where the towpath crosses Washington Road in Princeton. There's a parking lot next to Washington Rd. just south of Carnegie Lake and the canal, where a service drive heads up to the university's ballfields. If you get there late, we'll be heading eastward along the towpath, towards Harrison Street. The land along the canal hosts a remarkable diversity of native wildflowers, thanks to its combination of sunny openings and moist ground. 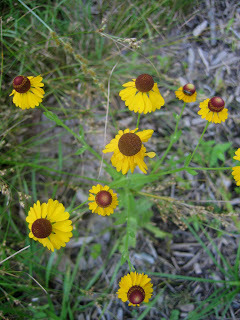 The reduced mowing regime instituted last year by the D&R Greenway State Park has allowed many previously suppressed species to flower and spread. The walk is sponsored by the Friends of Princeton Open Space. 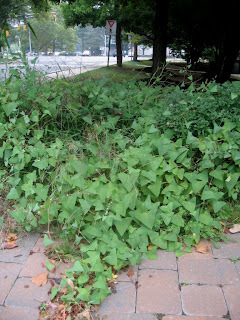 A new invasive plant has made its way to Princeton. While passing by on a bicycle, I found it growing next to a driveway within sight of the Princeton Shopping Center. It's triangular leaves and curved spines are unmistakeable. "Mile-a-Minute" is it's name--appropriate given its rate of growth. 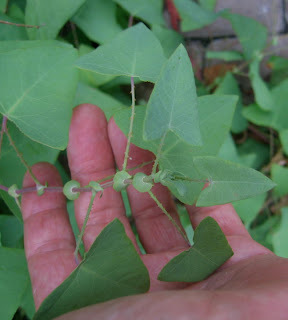 I'll add to this post when I find out where else it's been found, whether it's officially listed as a noxious plant in NJ, and any details about what to do if you find it. In the meantime, keep an eye out for it. If you find it, let me know, and if it's on your property pull it out! Update, 3/2011: After stopping by several times to knock on the door, I finally met the homeowner, who was glad to get rid of the weed. We pulled it out before it could make seeds, and haven't seen it since.